"Kiama have the potential to be the longest lived race in all of Etria, and are also said to be the oldest. Their teachings have been passed by song from Ancient to Seedling for generations, and their knowledge is invaluble for those hoping to study Etrian history. 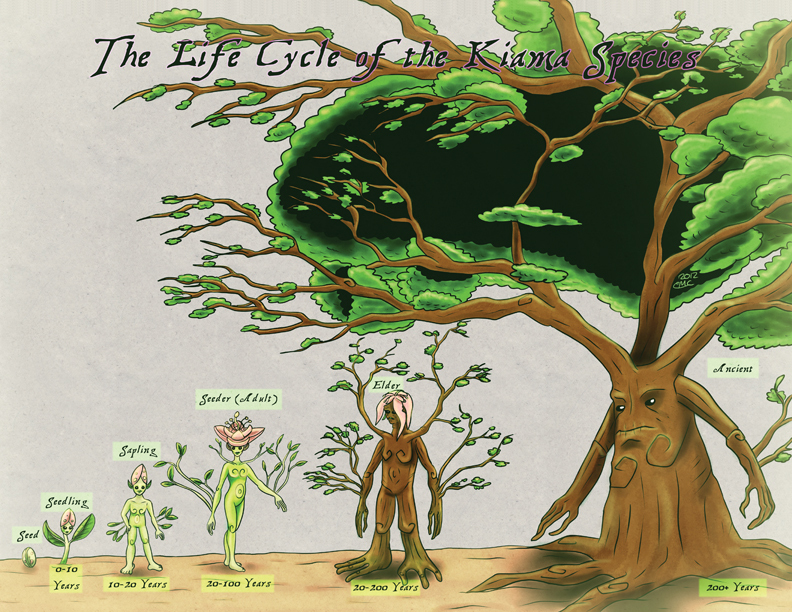 Kiamas have a very distinctive lifestyle. They are first planted in the ground as a seed, and they usually emerge 3-6 months later as a seedling. The young seedling remains planted in the ground until their mobility enabling limbs are fully developed, a process that usually takes roughly ten years. During this time, they recieve an extensive schooling from the local Elders, who in turn are guided by an Ancient. After a Seedling pulled from the ground to start their mobile life, they are called a Sapling. Young Saplings tend to be especially curious and energetic, and they use their newly developed limbs to explore the world around them. At the age of 20, a young Sapling's flower will begin to bloom. Once it does, the young Kiama becomes a sexually viable Seeder, and will remain in this state for the next 80 years. A Seeder has both a single pollen receiving carpel, and pollen producing stamens. Seeders reproduce by way of dancing to song furiously enough to release their pollen, and usually they congregate in large groups to maximize their chances of fertilization. Upon fertilization, one ovule inside their head migrates to their belly and develops into a seed over the course of a few months. When fully developed, the seed is expulsed via the mouth, and then planted. As a Kiama never stops growing, after a certain age, the Kiama's skin will start to become thick, and it will become more difficult to distinguish between a Kiama's limbs. Around the same time, the Kiama's flower will fall off, signalling their start as an Elder. As the Kiama slows down, they usually defer to the Ancient nearest by, taking advice as well as commands to help the plight of the younger members of their species. By the age of 300, unless the Kiama is dead, they will find themselves getting too big and thick to move. At this point, then will replant themselves in the earth, using their feet and legs as roots. As an Ancient, a Kiama can live for up to another 200 years, offering their wisdom and guidance to younger members of the race." PS. This weekend, I'll be at the Summer Festival! Read all about it here!